Chocolate and fruit are natural combinations that make tasty recipes. Along with the pleasure of combining the intense flavours of fresh fruit with the natural smoothness of chocolate, this is a great way to balance the admitted downsides of chocolate (high calories and fat) with some genuine health benefits of the fruit (fibre, vitamins and antioxidants). The fruit should be in excellent condition and perfectly ripe – under-ripe fruit tends to be hard and tasteless, while overripe fruit will be mushy or soggy. The chocolate needs to be melted with care or it will granulate and become crumbly and oddly coloured. This is the simplest recipe in the world as long as you have really good fruit to work with. It’s easier to make in high summer than winter, although with a bit of imagination you can ring the changes to make this a Christmas treat, too. Use 200 grams of 70% cocoa solid dark chocolate for both recipes. First, prepare the fruit. If you are using cape gooseberries, pull back the papery lanterns and wipe the soft fruit with kitchen paper to remove any dust. For winter fruit, cut the fruit in slices and brush both sides with lime juice to stop them browning, and lay them out on kitchen paper to soak up excess lime juice. Roll the apricots between your palms to soften them slightly, which will allow them to take up the chocolate evenly. Either line a baking sheet with non-stick paper, or use a marble slab if you have one. Melt the chocolate in a heatproof bowl over a saucepan of boiling water or in a microwave, stirring constantly until fully melted. Take care not to overheat, as the cholocate may scorch or become granular. Hold each piece of fruit by the stem, end or skin (for fruit slices hold with a cocktail stick, and then ease the stick out once it has been dipped). You may want to completely dip the fruit so it is encased in chocolate right up to the stem or end, or just half dip them so that the colour of the fruit shows. Set the fruit on the paper or slab and leave in a cool place for at least two hours. Don't refrigerate as that will cause moisture to condense on the surface of the chocolate and mar the finish. You may need to re-heat your chocolate in the microwave as you work, because it firms up quite quickly. One way to address this is to use a microwaveable heat pack (the kind that is used for sports injuries) under your bowl. It can keep the chocolate malleable until you’ve finished working. 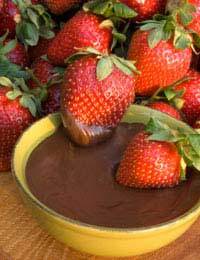 Once you’ve perfected the process of dipping fruit, you may wish to use two different kinds of chocolate for an attractive contrast. You could try white and dark chocolate, or dark and milk chocolate. Make sure the other chocolate is similar in quality to the dark chocolate, or it will tend to have a different consistency and may be difficult to work with. It’s important to allow an hour between dipping into the different chocolate, and at least three hours from the second dipping for the chocolate coatings to set. If your fruit is not pretty enough to work for the recipe above, you can still dip it (removing stems, stalks, ends and papers first) and then use it to fill these delicious chocolate crepes. Prepare and dip the fruit as above. Then sift the flour, cocoa and sugar into a mixing bowl. Make a well in the middle and add the egg, oil and a single tablespoon of milk. Whisk until smooth, then beat in the remaining milk and yoghurt, and refrigerate for 30 minutes. Using a piece of kitchen paper, spread a little oil into a small frying pan or crêpe pan and heat. Now add some pancake mix to the hot pan. Cook for about 40 seconds on one side, then flip using a spatula and repeat on the other side. Put the crêpes aside to cool. Fill with the dipped fruit before tying a liquorice bootlace around each one.